1) We have a beautiful beach house just south of Mandurah which is a summer library of sorts. It's where books that no longer fit on the shelf at home go to live when our family just can't bear to part with them. We are big readers on Mum's side of the family, and so we have a lot of books there! The Bell Jar by Sylvia Plath is a book that I found on the shelf down there when I was at a loss for what to read and I adored it! I'm going to link The Bell Jar to Colleen McCullough's The Thorn Birds, because I have vivid memories of reading both of these books during trips to our beach house. 2) The Thorn Birds is a big book; a romance novel that is also a sort of family saga. The first book that springs to mind for me when I think of similar books is Kate Morton's The Shifting Fog (Also called The House at Riverton). It's thanks to these two books that I have a lot of love for LOOOOONG historical romance novels, and partly thanks to novels like these that I write what I do. 3) In fact, if I could have written any one book that already exists, I would choose either The Shifting Fog or The Blind Assassin by Margaret Atwood. I love the settings of these novels deeply. They are steeped in nostalgia like old portraits and the way the timeline shifts back and forth to give bits of the puzzle slowly but surely is the perfect plot device for pacing. 4) I only ever borrowed very few novels from the University library in my time as an undergrad, but two that I can remember (that I actually read) were The Blind Assassin and Franny and Zooey by JD Salinger. I read part of Franny and Zooey in the library one rainy day when I was waiting for a class to start and loved it so much that I copied whole sections out into my journal because they felt so true to me. I especially liked the description of the kind of person who turns up in academic contexts and tries to bigmouth his way into getting respect. I wish I knew which journal I'd written these quotes in but I just don't know! 5) There are a lot of books out there whose titles mirror this pattern of naming the story after the main characters; one of my recent favourites is Rainbow Rowell's Eleanor and Park which is a young adult novel about a girl from a troubled home who changes schools and attracts a lot of unwanted attention from the local kids because of her old clothes and cheap haircut. Eleanor ends up sitting next to Park on the bus and through a love of music they become friends, and slowly fall in love. It's a book that captures the sense of urgency you feel when you're in high school and you're falling in love and most things feel like the end of the world. 6) One of the major themes in Eleanor and Park is bullying, which is also a theme in Ruth Ozeki's latest novel, A Tale for the Time Being. When I read this novel I was really shocked by the bullying, or ijime experienced by the young Japanese narrator which at times seemed to border on physical and sexual assault. It was interesting to note the cultural differences between the types of bullying in the two novels. 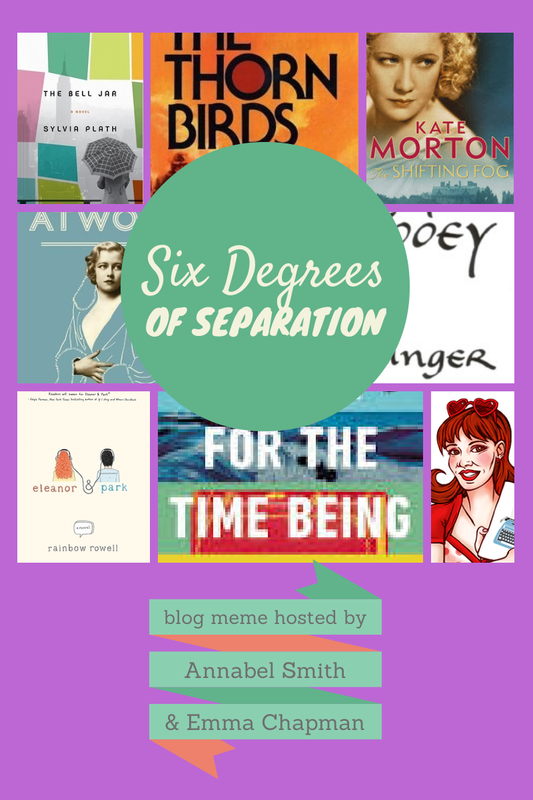 The six degrees of separation meme is hosted by Annabel Smith and Emma Chapman. Well, that's it! 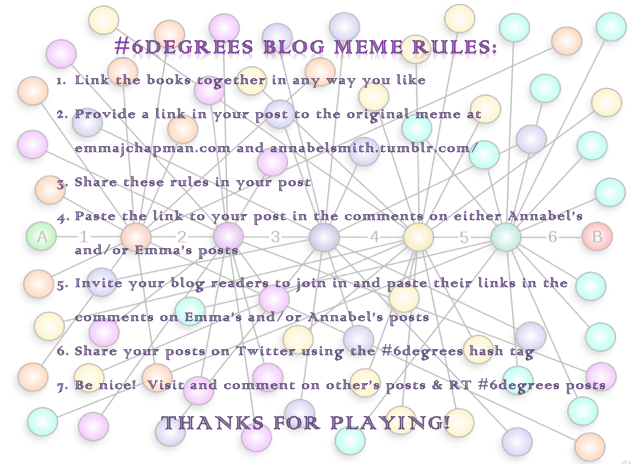 Make sure you post your link in the comments on Annabel or Emma's blogs if you want to play, and I'll catch you next time when we play Six Degrees of Separation. Thanks, I really liked yours as well!! It made me want to read The Last Banquet. A great meme that I'm having such fun doing. Its great that not only do we get to see other bloggers choices but also that we get to visit new blogs. I love how these are linked! I think I only borrowed two books from my University's library when I was there (this is embarrassing to think about now), but one was a Clive Cussler novel and the other was a Stephen King novel. I linked to Margaret Atwood too, but with The Handmaids Tale. Thanks for sharing your chain Emily!